This will help you better understand the distinctions made with properties on Zillow’s website and the MLS. With all this technology there are several different descriptions for a home listed. FOR SALE: The property is listed with an agent. In Zillow it is listed simply at “For Sale”. In the MLS it is listed at “Active”. This home is one of the smoothest transaction type and will be any easy transition second only to new construction. AUCTION: The bank is offering this property to buyers via an internet auction. Buyers can have access to the property prior to bidding on it through a licensed realtor. COMING SOON: Coming Soon listings are homes that will soon be on the market. The listing agent for these homes has added a Coming Soon note to alert buyers in advance. If one has an interest in the property, then contact us and we can approach the listing agent prior to it coming on the market allowing one to be the first few buyers to see it. FORECLOSED: This property is not currently for sale or for rent. Often times Zillow will let you know a home is Foreclosed but if it does not say “For Sale” then this means the bank has taken possession of property but has not yet listed it for sale. We will not have access to the property but can see it from the outside. It could be months before the property is for sale. This one will need to be “watched” until it comes on the market. FOR RENT: The property is for rent and is not for sale. FOR SALE BY OWNER: The property is for sale however this deal is a little more risky for the buyer since the seller is not represented by a real estate agent and is not beholden to OREC guidelines when marketing the property to buyers. They often are harder to negotiate with and may have unrealistic ideas about what their property is worth. MAKE ME MOVE: Homes with a Make Me Move price indicate the amount the owner would be willing to sell for. These sellers are not serious enough to actually list their properties with real estate agents. However, if you would like us to approach them with a legitimate contract, we are happy to do so. NEW CONSTRUCTION: This property has been newly constructed and has not been occupied by a previous owner. New construction comes with at least a one year builders warranty in the state of Oklahoma. This home will be the smoothest transaction type and will be the easiest transition. OFF MARKET: The property is not for sale. 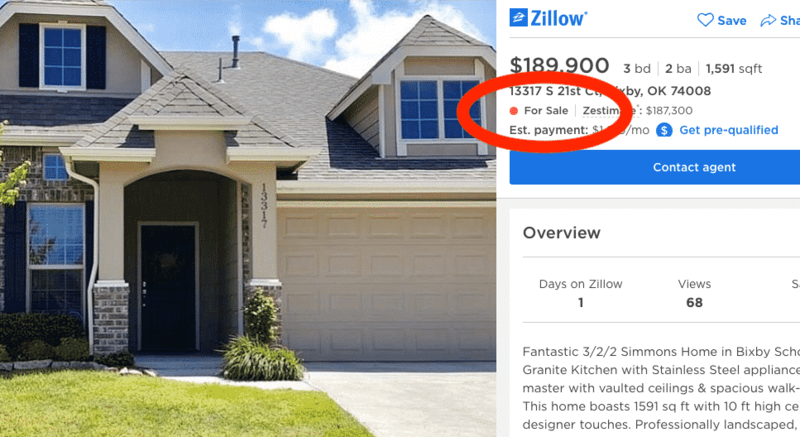 It is a part of Zillow records and helps them come up with the Zestimate. PENDING*: This seller has gone “under contract” with a buyer. During this period, buyer and seller are going through the process of closing on the property. Inspections are being done. Appraisals are scheduled and executed. And repairs are made. This usually takes up to 45 days, sometimes longer. This is the same in both the MOS and Zillow. PRE-FORECLOSURE: The property is not currently for sale or for rent. Pre-Foreclosure means that the homeowners have not been making their payments and the bank has notified the public that it WILL BE foreclosing on the property and evicting the homeowner in the future. Many times, the homeowners find a way to make their payments and the bank does not foreclose on the property. RECENTLY SOLD: These properties have recently sold, giving buyers a better understanding of what a particular home may sell for in a particular neighborhood. This does not show the full picture though and could mislead one on a particular value. If one is serious about purchasing a home, we would love to show you a CMA analysis of its value. SHORT SALE: The home owner is trying to sell the house for LESS than they owe the BANK. This situation requires the owner get permission from the bank to sell the property for less than they owe the bank and this process can take up to six months. Many times the bank does NOT grant permission to sell a house “short”. ACTIVE* / FOR SALE: The property is listed with an agent. In Zillow it is listed simply at “For Sale”. In the MLS it is listed at “Active”. This home is the smoothest transaction type and will be the easiest transition. CLOSED*: In the MLS, this listing distinction will be accompanied by a close date and the actual purchase price of the property. Zillow has a distinction called RECENTLY SOLD. Read about it below. The problem is that Zillow does not give the reader access to every closed listing. Just a select few. EXPIRED*: This MLS distinction is relevant because it shows a property that was listed but did not sell inside the listing period. This is a data must be accounted for because it tells a story about why a property did not sell. Most usually the price is too high. WITHDRAWN*: This MLS distinction is used when a client temporary withdraws their property from the market. Perhaps they are going on vacation and do not wish to show their property. Or perhaps they have family in from out of town. Or they are making repairs. RELEASED*: This distinction is used when a client “releases” an agent from working with them. A new listing is created when the next agent begins marketing the property. *MLS DISTINCTIONS: Zillow only has one record for each property as such these distinctions do not exist in Zillow. In the MLS however, there can be more than one record per each listing. Meaning there can be multiple listings records for a property. The outcome of a listing that is not active can be pending, closed, expired, withdrawn or released. This way, a Realtor can view prior listings for a specific property and the outcome. This data is often more valuable to ascertain value than the Zillow’s ZESTIMATE.